Unwilling to go down the same path as UFC 151, the Ultimate Fighting Championship has opted not to cancel UFC 176, but “postpone” the event instead. The card was slated to take place August 2 inside Staples Center in Los Angeles, California. Featherweight king Jose Aldo was slated to headline the show against Chad Mendes, but Aldo was forced to withdraw last week due to a neck and shoulder injury. With the promotion apparently unable to find a suitable replacement to take the pay-per-view’s top spot, the card has been nixed. Ticket refunds will be offered at the original point of purchase. If tickets were purchased from AXS via www.axs.com or Purchase By Phone, refunds will be received automatically via AXS. Tickets purchased from the Staples Center box office can be refunded there, beginning Wednesday, July 9. Those who purchased tickets at any other outlet should reach out to that original point of purchase and contact them directly for a refund. Aldo vs. Mendes II will be rescheduled for later this year. 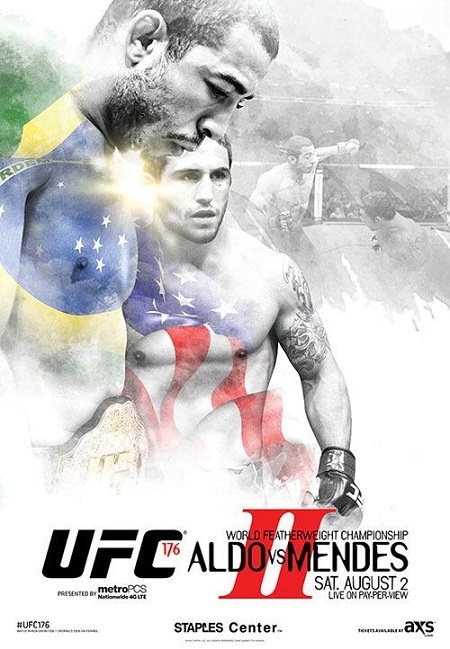 “Scarface” finished Mendes in highlight reel fashion with a knee to the face at UFC 142 in January 2012. No word on how the other fights on UFC 176 will be dispersed. The UFC was forced to cancel UFC 151 in September 2012 after Dan Henderson suffered an injury. To date, it is the only event the company has canceled since Zuffa took over the reins in 2001. That wasn’t the only announcement the planet’s premier mixed martial arts promotion made Tuesday. Former bantamweight champ Renan Barao will get an immediate rematch against TJ Dillashaw at UFC 177 in Sacramento on August 30. So, at least Cali will still get some live octagon action next month.